Well, I said I’d tell you how the snow day went if there was one and you knew there’d be one, right? The snow picked up again late Sunday afternoon and evening. We had eleven inches by the time we went to bed that night and after that there was no more accumulation. School was cancelled Monday and there was a two-hour delay on Tuesday. Because the cancellation was announced on Sunday afternoon and the roads were messy, North asked to stay over at Zoë’s house, where they’d been since morning. They came home late Monday afternoon with tales of sledding and making snow sculptures and toting a bag of chocolate chocolate-chip cookies they’d baked with Zoë. Beth’s office was closed, so she worked at home, and I did, too. Noah kept plugging away at his two Ithaca scholarship application essays and finished them. 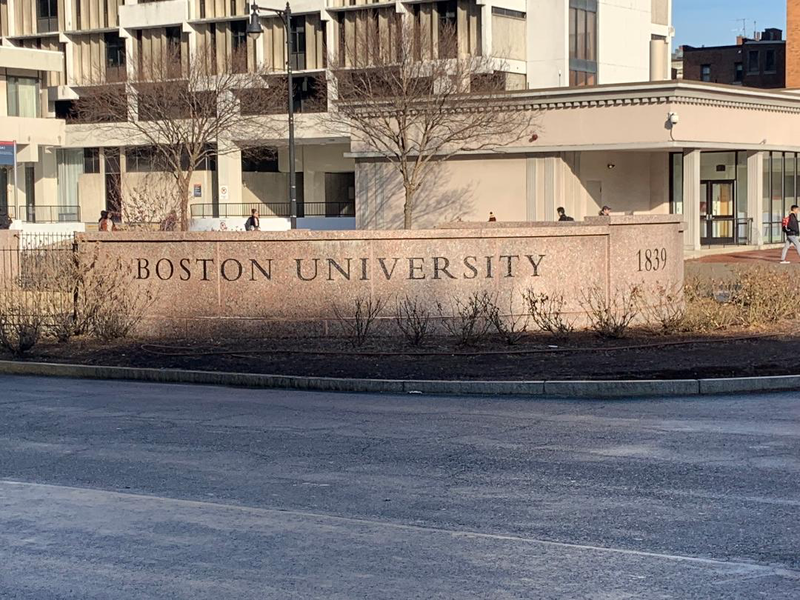 He’s now all done with applications, though he and I might be taking a trip to visit Boston University next month, as that’s the only school he applied to without visiting. 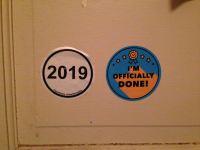 Champlain College, one of schools we visited last spring (though he didn’t end up applying there), sent an “Officially Done” sticker in one of their mailers, with the suggestion that he wear it when he finished all his college applications. I stuck it to his shirt when he submitted the application and he gamely agreed to let me post of picture of him wearing it on Facebook. 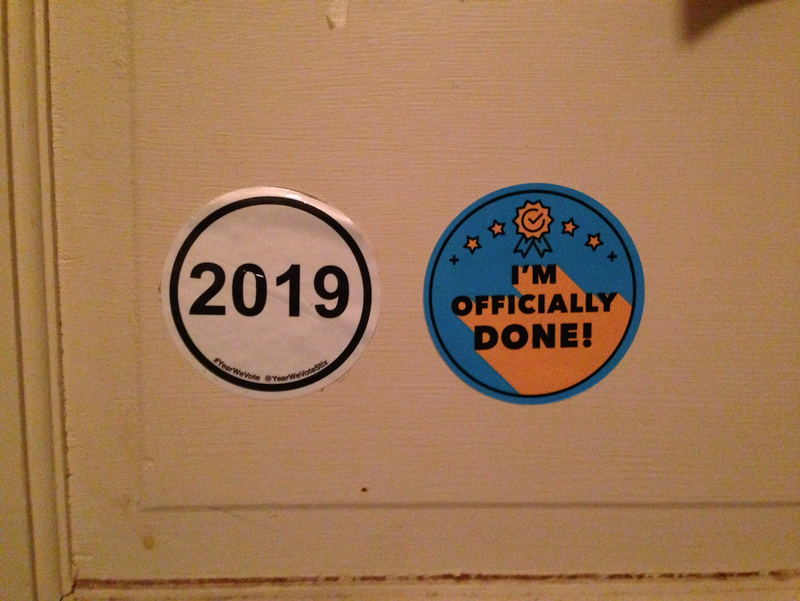 Then he took it off and stuck it to his bedroom door, right next to the “2019” sticker he got during one of many gun control protests last winter and spring. It represents the year he can vote in federal and state elections. (In Takoma Park, the voting age for municipal elections is sixteen.) But it’s also the year he leaves for college, so it makes sense for those two stickers to keep company. He didn’t have much time to celebrate, though, because he had an oral presentation and Logic homework due the next day. He didn’t end up finishing the Logic, but he put a dent in it. I’d been camped out in his room for a couple hours, still reading Jack London (short stories now, having finished The Call of the Wild the day before) and occasionally offering opinions when he’d get stuck with the essays. Once he switched over to homework, I went for a long walk in the snowy woods by creek and through a tangle of side streets in our neighborhood I’d never explored. I actually got a little lost, so the walk was longer than I intended, but I was home in time to make a mushroom and kale frittata for dinner, which we followed up with brownies Beth made earlier in the day. I won’t complain about the snow day. It was okay. I didn’t get as much work done as I would have if I’d had the house to myself, but was good for Noah to have more time to work. That’s a common trade-off. Me: He has skipped probably more performances than we could count for homework. I skipped one. Sara: Yeah, but it was THE ONLY ONE. Me: That’s not true. I remember going to a District Chorus concert. And various gymnastics performances and field hockey games. Sara: I mean the only performance of P.T. Barnum. And I had the lead. And a solo. Sara: WHY DO YOU STILL NOT LOVE ME??? Anyway… We all had an early dinner and drove out to the high school where the concert was taking place. (North’s school has no auditorium.) The performers had to be there forty-five minutes before concert time so we took our seats and Noah opened up his laptop and worked on his oral presentation until the concert started. 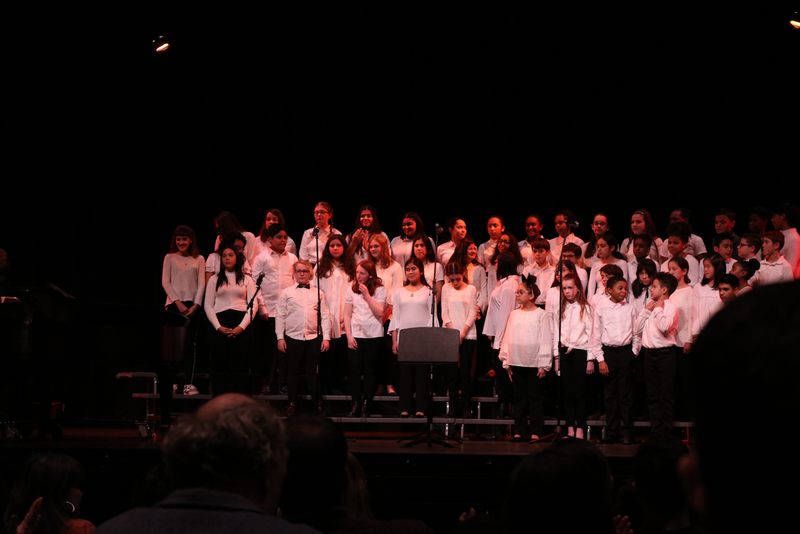 There were three groups singing—the Glee Club, the sixth-grade chorus, and the Advanced (seventh- and eighth-grade) Chorus. North’s in the Glee Club and Advanced Chorus and because the soprano and alto sections of the Advanced Chorus joined the sixth-grade chorus for one of their songs, they were singing eight of the ten songs. It was lovely. We were very proud. The next Glee Club song was “Never Enough” from The Greatest Showman. Apparently, there was a movie music theme. 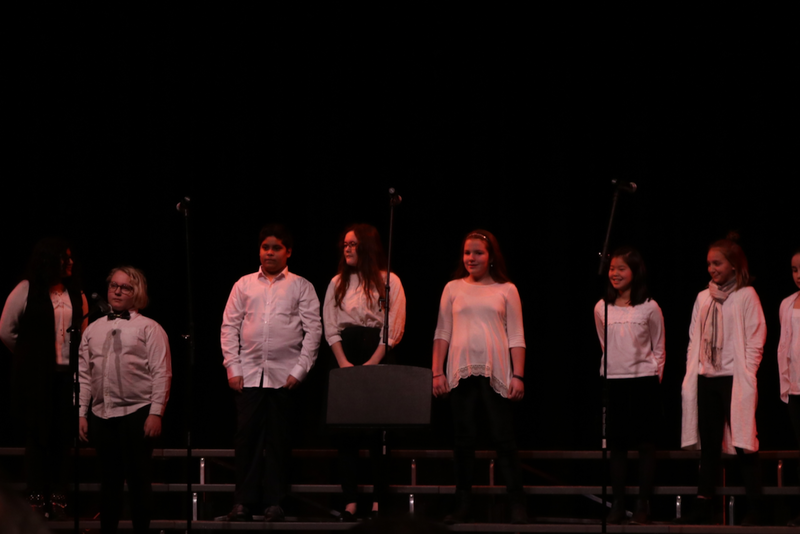 There was also a songs-in-foreign languages theme, as the sixth-grade chorus sang in German, Hebrew, and Spanish. (Mr. N said they were putting the “International” into Silver Spring International Middle School.) And later the Advanced Chorus would sing a Polynesian song and one in Zulu. Toward the end of the concert, the Advanced Chorus sang three poems set to music. “Night Fall,” by Roger Emerson, “Dreams,” by Langston Hughes, and a section of Edgar Allan Poe’s “The Bells.” While they sang “Dreams,” the lyrics were projected on two screens to either side of the stage. Mr. N made some comments about how the day of the concert was Martin Luther King’s actual birthday and how if he could be there he’d be pleased to see kids of different races and social backgrounds all making music together. “The Bells” is a particular favorite of mine. I used to teach it. They sang the first stanza, while one student accompanied the singers with jingle bells. North said this song was their favorite and I liked it, too. I thought the music was well suited to the words and the singing was fast but delicate and precise, just like bells. The whole concert was over in less than an hour. It was nice North got a solo because next quarter they’re switching their Wednesday afterschool activity from Glee Club to Drama Club and only Glee Club members got solos, so chances are they won’t have a chance for that at the spring concert. As we left, I was thinking a little sadly about how my father, who died nine years ago on the day of the concert, will never be in the audience for one of North’s concerts or plays. Not that he’d be traveling down from New York for school concerts if he were still alive, but if North gets their way, they may someday have a performance in his adopted home town. And depending on where North’s adventures take them years from now, I may not make every single performance either, but I know I am far from officially done watching my youngest on stage. The new year is almost two weeks old. On the first day of 2019, Beth and I went for a hike at North Point State Park. We invited the kids, but they both declined. (They’d both been up to see in the new year and we had not, having left the neighbors’ New Year’s Eve party early in favor of a regular night’s sleep.) 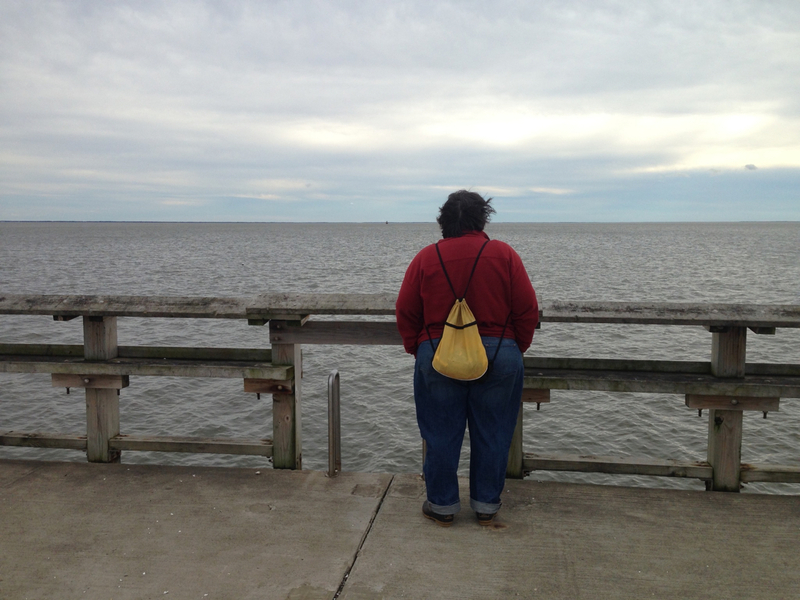 There was an organized First Day hike at the park, but high winds felled a big tree, which caused the rangers to re-route the hike off the trails, and along the park road and down a pier into the Chesapeake Bay. The rangers had said it wasn’t actually forbidden to walk the trails and it didn’t seem that windy, so we rambled in the woods a bit and then went home. That night I made a pot of black-eyed peas for good luck, but I ended up burning it. I salvaged just enough so everyone could have a scoop on brown rice with smoked cheddar on top and vegetarian sausage on the side. Still, I had to wonder if the fallen tree and burned peas were some kind of bad omen. It certainly could have been, if Beth or I were federal workers, but luckily our livelihood doesn’t depend on the President’s tantrums. My friends who work at the Department of Justice and the Smithsonian aren’t so fortunate. Even though I had work, I was out of sorts, a bit of post-holiday letdown, I guess. (Even the swearing-in of the new Democratic majority in the House didn’t help much.) I’m in the habit of taking a short walk every weekday I don’t have some other errand getting me out of the house and I’ve noticed since I started doing this a little over a year ago, it improves my mood, so I decided longer walks were in order. I tried to get off sidewalks and onto the muddy paths by the creek at least a couple times a week and I found even a half hour walk in the gray and brown winter woods can be restorative. Truth be told, though, the chocolate chip cookies I made one evening were even more cheering, if less healthful. Our wedding anniversary was Friday. 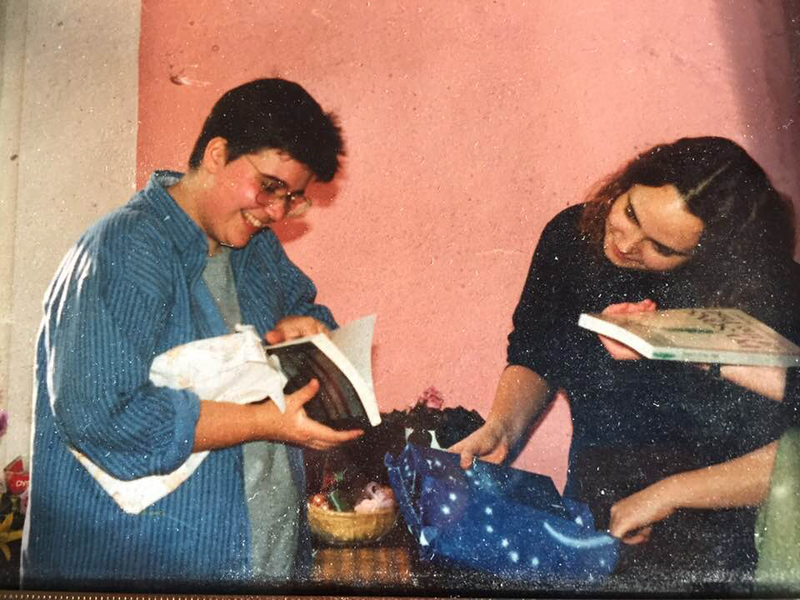 It’s been twenty-seven years since we committed ourselves to each other in the living room of our D.C. apartment, in front of friends and family, and six years since we made it legal in the living room of our Takoma Park house, in front of the kids and an officiant. Orange you glad you married me? North was unimpressed with my reasons for switching to the orange glaze from the traditional lemon one. “How could you?” they asked, right before I made it, and then demanded, “Does Beth know about this? It’s her anniversary, too.” We are all a little set in our ways sometimes and I am certainly no exception, so I can’t blame them. Anyway, I finished the cake with orange sprinkles. It was pretty. I should have taken a picture for you, but I forgot. I ordered pizza and hoped it would arrive around the same time as Beth, but it was a half hour late. When it finally came we ate and then exchanged gifts. Beth got me a pair of rain boots, which I very much needed, as my old ones were in bad shape, with multiple cracks in the rubber around the ankles. After dinner, we ate cake in front of the television, watching the second episode of the new season of Series of Unfortunate Events. We probably could have watched two before North’s bedtime, but this is the last season, so we are trying to savor it. 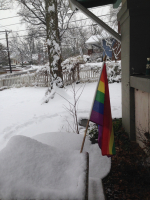 A snowstorm was predicted to start late Saturday afternoon and it arrived on schedule. When the snow started, I stood at the window and watched it a long time, trying to see the beauty in it, because my bad attitude about snow doesn’t do anyone any good. It even worked, at least a little. It’s undeniably pretty. 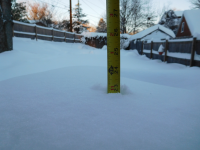 We woke to six inches of snow and it kept falling on and off throughout the day today. There was a cascade of cancelled events, including a dinner party friends of ours were throwing Saturday night and church the next morning. The pool and the library (my normal Sunday afternoon destinations) were closed. North was supposed to have a meeting at the theater about a talent show they’re directing (they won this opportunity in an auction) that was also rescheduled. When I got up this morning and couldn’t find the newspaper, which was never delivered, I gave up on the day having any semblance of normalcy and I decided to forget about breakfast for a while and went back to bed with The Call of the Wild, which North’s reading for school, and read the last four chapters. Later in the day when North asked what I’m glad about, I could say, in all honesty, that I’m glad I’m not a sled dog in the Yukon. By this morning, eight surrounding counties had already cancelled school for tomorrow, but there’s no word yet from our county. I am trying to resign myself to a closure so if the kids go to school on time, or with a two-hour delay, it will be a pleasant surprise and if school’s cancelled I will greet this news with equanimity. I’ll let you know how that goes. It wouldn’t be a bad day for Noah to miss school, actually. He had a ton of homework this weekend, including but not limited to two oral presentations, and a chapter in his logic book with questions, and he’s working on an scholarship application for Ithaca that requires two five-hundred word essays. It seems unlikely he will finish all that today. So I know he’d be glad of an extra day. And I’m glad of a lot of things other than not being a sled dog: that I married Beth and we have two great kids chief among them, but I’ll also be glad when Noah walks to the high school bus stop and the middle school bus pulls up to our curb, whether that’s tomorrow, Tuesday, or sometime after that. The new year got off to a bit of a rocky start. 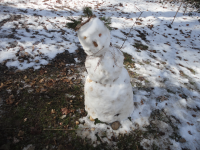 In the first two weeks after winter break, the kids had a snow day, two two-hour delays, and an early dismissal—all for three-quarters of an inch of snow, one unusually cold morning, and a little (I swear not much at all) ice on the sidewalks. It was disheartening, especially because it was a busy couple of weeks for work. I can and did work with the kids home– they’re old enough not to bother me too much when I’m working—but I just can’t concentrate as well when I’m not alone in the house, so each new cancellation or delay was frustrating. It’s possible I’ve been ruined for working in an office, after almost six and a half years of working at home. Beth and I had an anniversary on Thursday. It was the twenty-sixth anniversary of our commitment ceremony and the fifth anniversary of our legal wedding. Beth’s mom posted this photo, taken in our apartment in D.C, of us opening wedding presents on Facebook. Look at us! We were practically babies. Well, twenty-four and twenty-five. I was a mere eight years older than Noah is now. Now I am trying to imagine myself at his wedding eight years hence and wondering where the baby who lived the first year of his life in that apartment with the salmon-colored wall went. As of Tuesday, I didn’t have a gift for Beth. I’d decided to get her some gift certificates from AFI too late to order them through the mail, so I got on a bus to Silver Spring that morning and picked them up from the theater. While I was in downtown Silver Spring, I also got a mocha, lunch at BurgerFi, and spent a long time browsing for some small gifts at Whole Foods so I’d have something to wrap. I settled on treats one might eat at the movies (dark chocolate-covered almonds and milk chocolate-covered pretzels) to keep the gift thematically consistent, and got a card with a heart on the front and I was done. 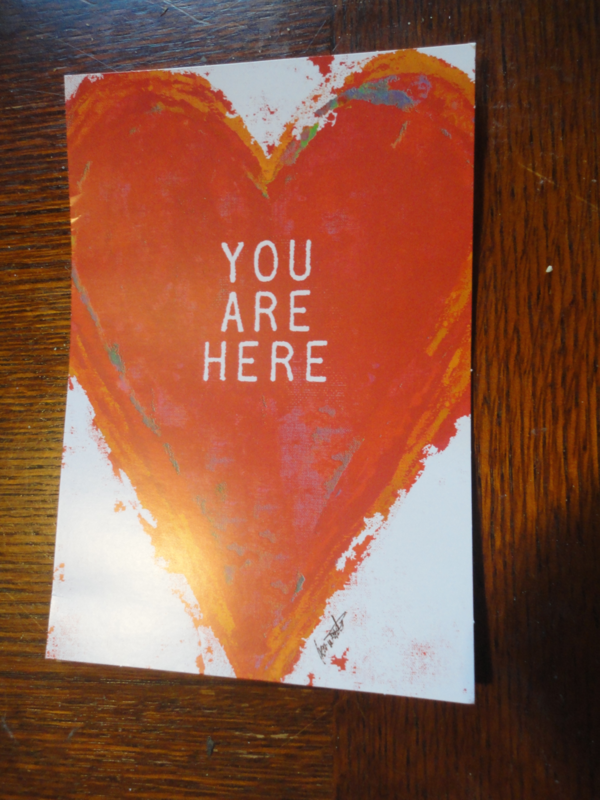 Except when I got home, I opened the card and discovered it was a Valentine’s Day card. Why are these on sale already? Who buys valentines a month in advance? Clearly not me. 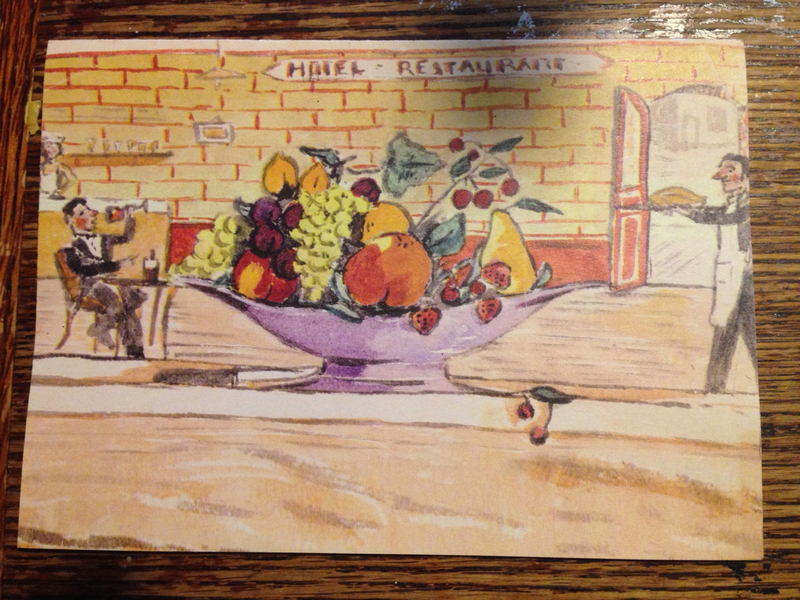 And then I couldn’t stop thinking about another card I’d seen there, which was obviously superior. So, the next day, instead of being practical and going somewhere in Takoma for a new card, I went back to Silver Spring and got the card I wanted. It has different colored buttons all over it in the shape of a heart and it is blank inside. Thursday I made our anniversary cake, the one we had at our commitment ceremony and at our legal wedding. It’s a spice cake, with a lemon glaze. I covered it in red and blue colored sugar. Because I didn’t leave myself quite enough time to bake a cake for forty-five minutes and scalloped potatoes for an hour at different temperatures, dinner was a little late, so Beth and I exchanged gifts before dinner rather than after. She got me Reckless Daughter, the Joni Mitchell biography that came out last fall and which I thought someone might get me for Christmas. That’s one of the advantages of a mid-January anniversary—it’s a chance to get (or give) what you didn’t get (or give) at Christmas. North had dinner at Xavier’s, but when they got home, we all ate the cake we always eat together in mid-January and our anniversary was over. Saturday I worked a little and Beth took North and Xavier ice skating and out to dinner, bringing back take-out for Noah and me. Yesterday, Beth, North and I went to church. 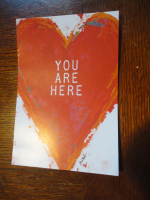 We’ve never been church-goers, but recently North has become curious about church and asked recently if we could try out a Unitarian Universalist congregation. (We’ve been to UU services a few times when visiting Beth’s mom.) It was the third time Beth and North have gone to this church and the first time I went with them. There’s a part of the service called the Communion of Joys and Sorrows in which people tell the congregation about a joy or sorrow in their lives and light a candle for it. I recall Beth’s mom’s church does this, too, but with stones dropped in a bowl of water, if I’m remembering correctly. Two of the people who shared we knew slightly. One of my colleagues from my teaching days shared that her son had won an award at college. And there was a lesbian couple who shared that one of their mothers had suffered a fall and broken an ankle and that a nephew was newly married. Beth thought one of them was a gym teacher from Noah’s middle school. Overall, there were more sorrows than joys. I asked Beth if that was always the case and she said so far yes, speculating that maybe people need more support for their sorrows or don’t want to seem to be bragging about their joys. If I’d had to share something I probably would have gone with a sorrow, too, because it was one day before the eighth anniversary of my father’s death. I knew the day was coming and I wasn’t feeling very emotional about it. Some years I feel it keenly and some years I don’t. However, when I woke this morning, it hit me hard. I lay in bed thinking about Dad and about the fact that there’s snow coming tomorrow and Wednesday and if we get off with just an early dismissal and a two-hour delay on the affected days, we’ll be lucky. Everything seemed bleak. I didn’t particularly want to get up and I didn’t particularly want to spend two hours picking up trash around Long Branch creek, even though that’s our traditional MLK Day of Service activity. We’ve been doing it since the kids were small. But Beth made homemade waffles, which made getting up a little more attractive and all of us except North, who was feeling under the weather, went to the woods near the creek and picked up trash and recycling, mostly beer cans and bottles. It was cold but we were moving around so it wasn’t too bad. I even got warm enough to unbutton my coat and take off my gloves, which I shouldn’t have done because I got cuts on my hands from the thorn bushes and they ended up smelling like stale beer. I also kept getting stickers in my hair, which I should have worn in a ponytail. Even with all the thorns, it was good to be focused on poking around in the brush, looking for the next can. It kept my mind off other things. After a quick lunch at home, Beth and I went to AFI to redeem one of the gift certificates I got her for our anniversary. We saw The Post. Have you seen it yet? If not, you should as soon as you possibly can. It made me feel hopeful about journalism and democracy, and that’s no small feat these days. Now, as the fifty-year-old daughter of a journalist I must admit movies that take place largely in 1970s newsrooms are right in my nostalgic sweet spot, so you can take my recommendation with that in mind. From the movie, we went to Eggspectation for coffee and cake. I got a piece of chocolate-peanut butter Smith Island cake. The best thing about the whole day was how it was a mostly unintentional tribute to Dad. 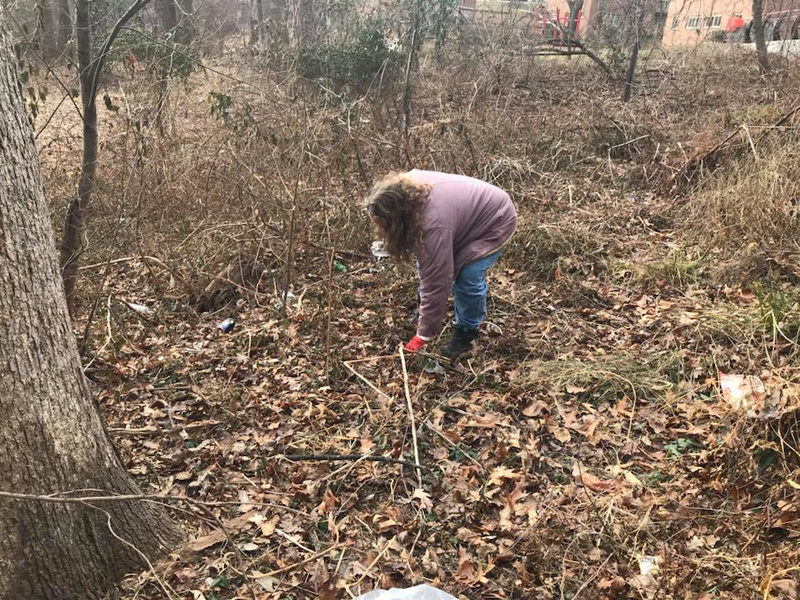 He might not have taken part in an organized creek clean-up, not being much of a do-gooder, but he was in the habit of picking up all the trash on his block. (I, too, often come home from walks with a tote bag full of recyclables.) He was a newspaper editor in the 1970s (and beyond) with a passion for investigative journalism and politics. He loved coffee and most desserts, but especially chocolate. 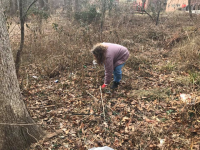 But we always do the creek clean-up on MLK day, The Post was opening this weekend and I’d just gotten Beth movie ticket certificates so it was natural we’d go see it. All the plans were made before I even thought about what day it would be. The only detail I added with him in mind was going out for cake. My father wasn’t an easy man to get along with and we didn’t always get along, especially when I was in my late teens. But there’s no doubt that I am his daughter in many deep and lasting ways. And that’s more of a joy than a sorrow. 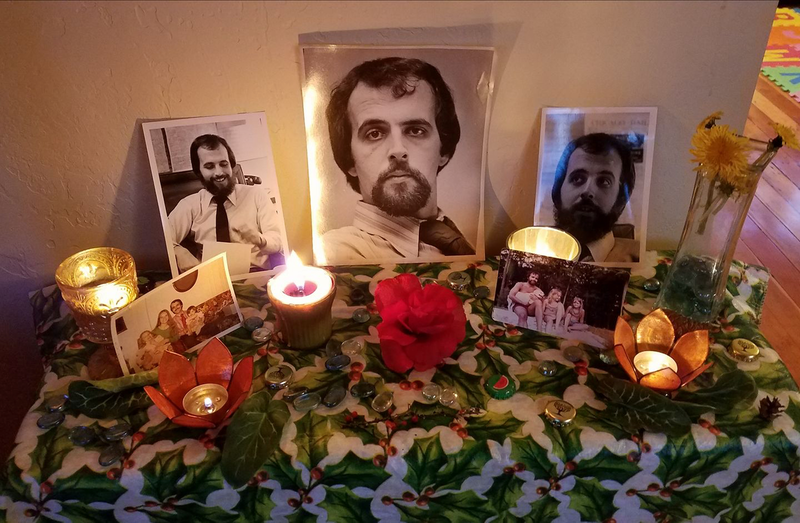 Note: The last photo is of a little altar my sister made for Dad today. 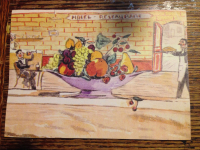 When I was in college I ate and most years lived in the student-run co-operative houses at Oberlin. A friend of mine who was a menu-planner at one of the co-op where I lived recently posted a recipe on Facebook for a casserole from those days. It features noodles, canned tomatoes, kidney beans, ground beef, and cheddar. I didn’t recognize the exact recipe but it seemed like the sort of simple, hearty, easy-to-cook-on-a-large-scale fare we ate back then. For some reason it was called Siberian Train Wreck. I decided I’d give it a try, for old time’s sake. It amused me to write the name on the white board, and given the predicted weather and how it was likely to derail the region, it seemed appropriate. If you live on the East Coast or know someone who does you’re probably aware we had a big storm last weekend. 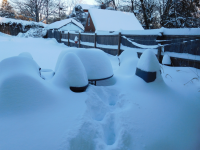 Snowzilla dumped two feet of snow on the Washington area. It snowed from early Friday afternoon into the wee hours of Sunday morning. The school system panicked and cancelled Friday, which irritated me because if they’d done an early dismissal, the kids would have been home before the first flake fell and even if they’d had a full day of school they would have been home before the roads were messy. An inch of snow is just about the right amount for me. I know this because we got an inch two days before the big storm and even though the roads became impassable and I had to walk home from book club and there was a two-hour delay the next morning, it was kind of fun, walking home in the snow in a group of fellow book clubbers and taking June down to the creek for a walk the next morning. It was a fluffy, sparkly snow, quite pretty, and I let June venture out onto the ice of the half-frozen creek further than seemed 100% safe because I’ve been trying to encourage her to get back into the habit of playing outside and I thought she’s only going to do it if I let it be fun. And what’s more fun than a little danger? I didn’t stay at the bakery long because I needed to go get June from Megan’s house They had a five-hour play date that day—it started at our house and then moved to Megan’s house during the gap between my press release deadline and Megan’s mom’s conference call. June and I got back home around 2:40, twenty minutes before the blizzard warning took effect. Beth had come home early and Noah, who had been home all day, was studying his lines for a scene from Romeo and Juliet his drama class is going to perform whenever they go back to school. So everyone was present and accounted for. We passed a quiet afternoon and evening. We live on a busy road so it’s notable when traffic stops but by evening it was only plows, police, and emergency vehicles in the deepening snow. 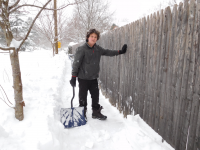 We woke to thunder and eighteen inches of snow on the ground and more coming down hard, but we decided we’d better start shoveling so it wouldn’t be impossible when it did stop. We have a corner lot and a big back yard so we have a lot of shoveling. 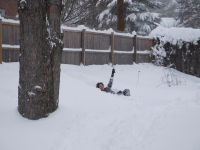 June wanted to try sledding on the rise in our back yard, but the snow was too deep and powdery and the sled just got stuck. I asked Noah to try to make a sled run for her by going down it a few times and he tried but he couldn’t make anything workable. When we came inside I read a chapter of Harry Potter and the Prisoner of Azkaban to June and we all had hot chocolate and soup and grilled cheese sandwiches for lunch. Noah had a list of sixty English vocabulary words to memorize and exercises to do with them, so I quizzed him on these while Beth and June made chocolate chip cookies. In the late afternoon, we watched Harry Potter and the Chamber of Secrets. June had seen it already at a slumber party but even so, she needed to sit between Beth and me and hold Muffin (her favorite stuffed animal) on her lap during the basilisk scene. This strengthened my resolve not to let her watch anything past the third movie for a while because I know they just get scarier as they go along. No one felt like making dinner, so we heated up frozen tamales and lasagna and June had hot dogs with leftover soup from lunch. I got into warm bubble bath to soak my sore back and read the newspaper, which had miraculously arrived that day. Meanwhile Beth and June listened to a Nancy Drew audiobook and Noah practiced his drums. Once June was in bed, I read Library of Souls to Noah. It was snowing when we all went to bed and the sidewalk we’d shoveled was filling back up. The next morning the snow had stopped—Beth measured 23 inches on our patio table—and the sun was shining. 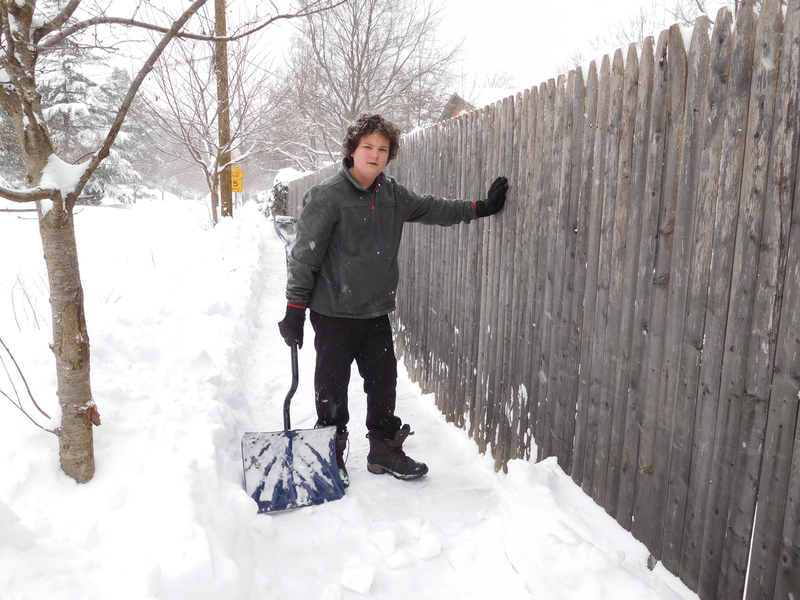 Beth, Noah, and I shoveled the walk all over again, an easier job the second time around, and Beth and Noah lent some neighbors a hand as well. 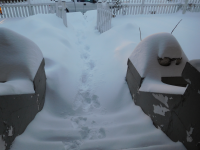 We had one fewer shovel to do it with, as someone had stolen one off our porch. The footprints in the fifth photo belong to the thief. I read to June again while Noah started to memorize a monologue for another drama class assignment. Then two neighbor girls came over to play with June so their mom could return a child who had gotten snowed in with them while her younger sister was being born. Our neighbor needed to re-unite the girl with her parents at the hospital and then drive the whole family to their house in D.C. This was why Beth and Noah dug out their car earlier in the day. I was tempted to go to bed and hide with a book when I got this news but instead I checked in on Noah and found him despondent about his progress memorizing the monologue (which is based on Beth’s mom’s memories of her youth in the 1950s). I broke it into chunks for him to make it easier to learn, ran him through the first five chunks several times, and then suggested he take the rest of the day off since he wasn’t going back to school until Wednesday at the earliest. He went downstairs to practice his drums while Beth made a white bean soup for dinner and June played with the little girls. They are in first grade and preschool and June’s really good with them. It makes me think she might be babysitting in a few years. They played with My Little Pony figures they brought, June’s American Girl doll, magna tiles and the castle and its inhabitants. They only had to resort to a Care Bears video almost three hours into the visit. By Monday I was feeling I needed to get out of the house so I was happy to meet Becky, June’s preschool music teacher and a friend of the family for lunch at the bakery. Becky and June have an upcoming acting and musical performance together (more on that in another blog post) and they needed to go over their lines. It was quite a challenge getting there. Nearly all the sidewalks were shoveled but the bridge over Sligo Creek wasn’t (it never is) and there was a long stretch of sidewalk belonging either to the hospital or the university that wasn’t either. Usually we could walk in other people’s footprints, but on the bridge there were no footprints and the snow was halfway up my thighs. I struggled along for a while, with June trailing me, but eventually we had to walk in the street. At the bakery they were still out of a lot of their menu items, but they had the makings of grilled cheese sandwiches, so we ordered three of them and chips and drinks, and a big lemon bar to share three ways. We ate and then June and Becky practiced their lines. I went across the street to the Co-op for more groceries for us and a gallon of milk for a neighbor. When we’d left the house, there were two men shoveling out our driveway again and I texted Beth to see if they were done and if she could come get us. She could and she did. It had been just about the right amount of adventure walking there but I didn’t really want to do it again. Beth took the kids sledding shortly after we got home while I stayed home to work. They came home sooner than expected and when they got onto the porch I could hear June was crying. She’d flown off her sled and sprained the pinky on her right hand. 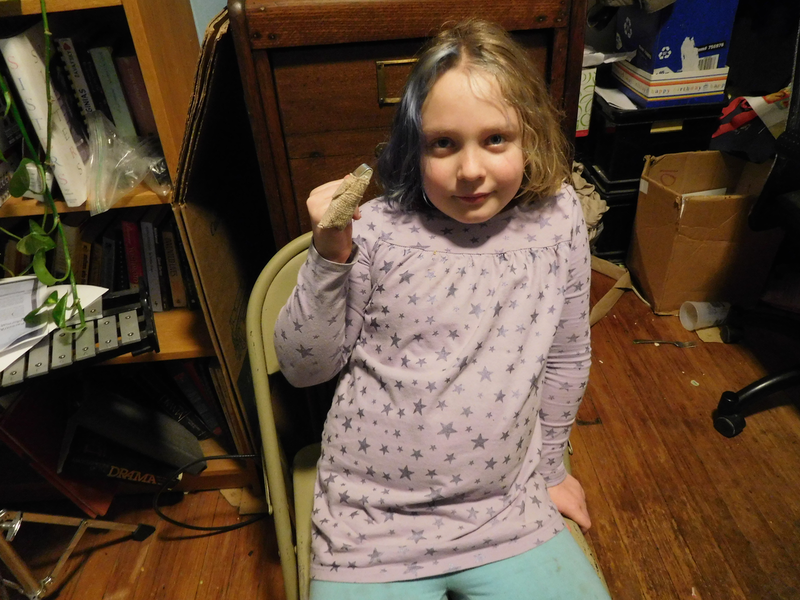 Beth took her to urgent care to make sure it wasn’t broken and they came home with June’s pinky in a splint. 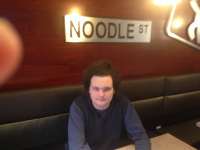 That night I made the Siberian Train Wreck for dinner. Beth said it was “just like Hamburger Helper” and it was. Sometimes that’s the kind of food you want. Tuesday was the day I really lost it. The trigger was Girl Scout sleep-away camp registration. Last year the process had taken three hours and nearly brought me to tears. This year was worse. It was also worse than the dream I’d had the night before before about walking down a long, swaying bridge with no handrails. I was logged onto the site at 10:01, one minute after it opened. There were 1,004 people ahead of me in line. I waited patiently, watching the count go down until it was my turn. This took a little less than an hour, about what I’d expected. Once in the site I rushed to find June’s choices. There were two spaces left in Storm the Castle, an archery-themed program and her first choice. Her friends Maggie and Leila were trying to get into that one, too. But by the time I got through the registration process it said the session was full. I thought it had filled while I was registering, but when I went back to the selections to see what was left, it was still showing spaces, more in fact than there had been before. I kept trying over and over to register her either for Storm the Castle or to get on the waiting list for her second choice, Artistas, which was full but allegedly had space on the waiting list. I asked Beth (who was working from home) for help and she tried, too, but all we could get to work was my very last choice—Moonlight Mania, a program based on staying up late. Even though I’ve gotten more relaxed about bedtime recently, it’s still a hang-up of mine and this seems like an almost comically bad choice. Plus June doesn’t even really like staying up late. I regretted registering her almost immediately, as it leaves me with the decision of whether being the mean mom who says June can’t go to Girl Scout camp or whether to worry for six months about sending her to this camp. 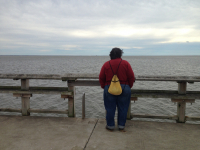 Beth gingerly suggested we all give it time before making any decisions. She seemed wary of me. This could have to do with the fact that after I got off the computer I started to cry and once I started, there was no stopping and I had to shut myself in our room. I wasn’t even sure what I was crying about anymore. There were too many options. Later in the day I learned Maggie got in to Storm the Castle and Leila got on the waitlist for the same session, which I would have considered a better outcome than what we had. After I’d made lunch for all three kids and Claire left, I decided I really should be getting some work done, so I outlined a couple of brochures and worked on some social media posts. If Tuesday was the day I lost it, Wednesday was the day my stay-at-home mom friends started to lose it. After three snow days with nary a complaint, when the fourth was announced around 3:30, my Facebook feed lit up with laments. This must be the point at which it seems the kids are really never going back to school. Apparently we live in the worst possible place for this kind of misery: south and we wouldn’t get big snows; north and our cities and towns would own the equipment needed to clear them away in a timely fashion. Thursday morning I was tempted not to get out of bed but I decided it really would be better for me if I did and that it might even be a good idea to try to get out of the house, which I hadn’t done since I waded through the snow banks to get to the bakery on Monday. We were running low on milk, so I walked to the 7-11, which was good and bad. Good because it got me moving and it was a mild, sunny day. Bad because it allowed me to assess how well cleared the streets and sidewalks are in my neck of the woods and how ridiculous it is that we can’t break our huge county into at least two pieces for snow cancellation purposes. Anyway, after lunch Becky came and rescued June from her cranky mother and took her to her house for three hours, where they practiced for the performance and had a tea party. I wrote most of a brochure on fiber supplements while she was out of the house. When Noah told me school was cancelled the next day I wanted to say some very bad words. Instead I said, “I suppose you wouldn’t make that up just to torment me,” and I went back to work. I am a paragon of restraint. But there was a small ray of hope. In the evening Noah had a drum lesson that wasn’t cancelled. It was the first organized activity either kid had that hadn’t been cancelled in a week. I don’t know when the kids will be back to school. I hope it will be Monday, but at this rate, who knows? We once had a longer cancellation, but that was for three feet of snow. We’ll exceed our allotment of snow days for the year when we have our fifth one tomorrow and then there will probably be some more and then there will be drama about whether or not we’re going to make up the extra days and chances are we won’t and then I’ll be mad about that all over again. But in the meantime, I’ve invited Megan to come to our house tomorrow morning and then in the afternoon Megan’s mom is taking both girls to meet another friend at Kung Fu Panda 3, so chances are I’ll get some more work done and we’ll all survive another day. I don’t even know what to say about the last few weeks. The last week of February was difficult and the first week of March was worse. The last Thursday of February Beth and June and I attended a memorial service for a forty-four-year-old woman who died of breast cancer. We did not know her well, but she was the mother of one of June’s preschool classmates, a girl who also played on a soccer team with June in first grade and on her basketball team from kindergarten to second grade. Grief would be too strong a word to use because we weren’t friends, but her death did make me very sad, for her not being able to see her children grow up, for her widowed husband, and most of all for her four girls, aged six to twelve. And then there was the weather. In the space of two weeks school was cancelled on four days, not to mention a two-hour delay and an early dismissal. (That last one was scheduled, at least.) This brought us to seven cancellations for the year, three over what’s built into the school year. And even though the school district promised to make the days up this year, they’ve gone back on that and applied for a waiver from the state, which means my consolation prize of three days of uninterrupted work in mid-June might not come to pass either. We’ll see. It’s the disruption of trying to work with kids at home, it’s needing to decide which of the things other than work that I usually do that I am not going to do, it’s the loss of quiet time that’s important for me as an introvert, it’s the fact that I also lose the chance to recharge through exercise when the pool at PBES is closed or through socializing with other adults when basketball practice or my book club is cancelled…And this is unique to me, but it brings back my grief for my father because he died shortly before the big storms of 2010. This is what I meant about my father. It doesn’t happen every time school is suddenly closed, but when we have a great many cancellations in quick succession, it often brings me back to the-world-is-spinning-out-of-control feeling I had in the winter of 2010, when the kids missed two and three weeks of school respectively. (June was in morning preschool then and if the school district had a two-hour delay, her whole day was cancelled.) The bulk of those storms happened the month after my dad died and it’s clear that these two events got cemented together in my mind in a way that makes me overreact to the real but honestly not dire inconvenience of having the kids at home on a workday. I understand it’s not quite rational but that doesn’t change it. Add some painful private difficulties to the mix and I haven’t been much fun lately. But so far I haven’t had a day as bad as Saint Patrick’s Day last year (our tenth and last cancelled day that year). I spent that day mostly in bed, with the blinds drawn, listening to an audiobook–and to make matters worse, it a pretty bad audiobook. I was afraid all this winter of going back to that place and I thought I had around two weeks ago, on the first Monday of March. 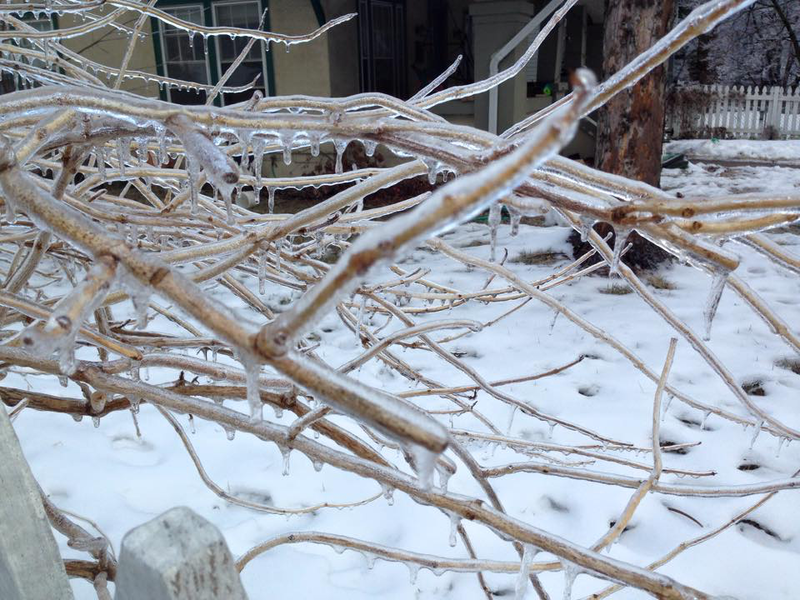 We’d had an ice storm and school was cancelled. I’d woken at 5:45, sore all over from having spent two hours the previous afternoon chipping ice off our sidewalk, but at 9:00, I was still in bed and I hadn’t eaten breakfast. It wasn’t that I wasn’t hungry. Getting out of bed and getting myself something to eat just seemed too daunting. I finally did get up, though, by focusing on the goal of putting a load of laundry in the washer. I decided to get the newspaper while I was at it and bring it back to bed. When I went outside at first I thought it was raining, which was strange because it was a bright, sunny day. Then I noticed that when I wasn’t standing under a tree it wasn’t raining and I realized it was water dripping from the rapidly melting ice. 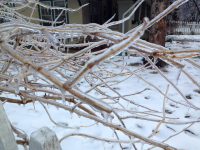 It was such a strange phenomenon I called June outside and we walked all over the sunny, sparkly, ice-covered yard, looking at every twig and every tall weed outlined as if in glass and listening to the water patter on the frozen ground and the ice breaking and falling off the tree limbs and the shrubbery and the clothes line. Startled out my lethargy, I decided to eat breakfast instead of going back to bed and told June I was going to the creek to do something and asked if she wanted to go. What was I going to do? Come and see, I said and then I went back to the front yard and filled the wheelbarrow. Noah, watching from the porch in his pajamas, guessed correctly. “Are you going to dump that in the creek?” he said. June did come with me, half amused and half embarrassed, as I pushed the wheelbarrow a block from our house and then she watched, bemused, as I heaved the contents over the railing of the bridge. She told me I was “completely insane.” Perhaps, but I felt better enough to muddle through with my day and not to go completely off the rails when school was cancelled again on Thursday and Friday. Though when Beth took June to work with her on Friday I really wasn’t sure if she did it because June likes to go to work with her, or to give me a chance to work in a quieter house, or because she wanted to spare June from me because I was still in a pretty bad mood. She didn’t say and I didn’t ask. 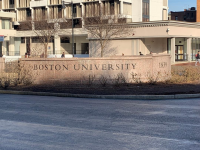 On that day, after I finished working, I walked to the library to return a book and while cutting across the campus of the university near our house I saw ten robins crowded onto a strip of exposed grass and mud over what must have been a warm underground pipe. Two days later on the same campus, I saw two clumps of crocuses, yellow and purple, almost a month later than they usually emerge, but there nonetheless. And now, after a week of warm weather, we have crocuses in our yard, too, and hyacinth and daffodils poking their way out of the newly visible ground. Over the course of last week, life slowly settled back into its usual groove. The kids went to school five days in a row. I swam on Sunday and had a book club meeting on Wednesday. June had a violin lesson, a Girl Scout meeting, a basketball practice, gymnastics class and a basketball game. Nothing was cancelled. Although I appreciate this normalcy, I still feel tender and exhausted. I have a mistrustful feeling about it, like I’m waiting for the other shoe to drop. The change to Daylight Saving Time, which has seemed easier in recent years as the kids get older, seemed very hard this year. I’ve been tired all week, and I’m not the only one. On Friday night June put herself to bed, fully clothed and without telling us. I only discovered her fast asleep when I went to tell her to get ready for bed. The Pandas’ last game was yesterday. They lost, which was not surprising as they lost every game this season. Their defense is pretty good and while four or five players are on the verge of becoming good offensive players, they have no one who can consistently score, and if you can’t score, you can’t win. 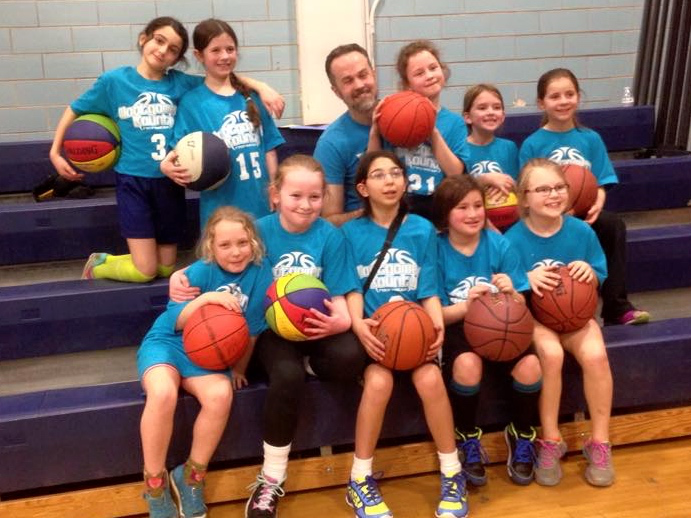 Mike, their coach, has somehow remained positive and encouraging through all this, and for the most part the girls have been positive, too. I mean, look at the picture. It was taken right after the end of the last game. Do they look discouraged? They’re eight and nine years old and while some of them want to win, some of them just want to have a good time. Plus they were on their way to an end-of-season party (graciously hosted by Talia’s family) and they were excited about that. They live more in the moment than I do. I know June was very solemn at the memorial service and sad at the death of her friend’s mother, but I don’t think it touched her too deeply. It’s harder for me now not to be touched by things like that, even when they’re peripheral to my life. My book club is reading Anna Karenina and I found when I got up to the part when she confesses her affair to her husband, it seemed so much sadder to me than when I read it as a grad student. It was the whole situation–Alexei’s pain, the way he hides it (from himself and Anna), which leads her to read him as cold and uncaring, which makes her think she might as well tell him what he already half-suspects and desperately wants not to know for certain. I felt so sorry for both of them…I think I read more emotionally now, maybe because I’ve been out of academia for almost a decade and I no longer worry about being sufficiently detached and theoretical. Or it could just be that I’m middle-aged and I’ve seen more of life and what it does to people. I don’t think I’ll end up throwing myself under a train any time soon, though. I have children to raise, after all, and daffodils coming up in my yard. On Friday morning Beth got up at 5:45, as she does every weekday morning. It’s her job to get Noah out the door and mine to get June out the door and I have the easier job by far. June requires much less oversight to stay on task and she doesn’t have to be at the bus stop, which is right across the street from our house, until 8:15. I am not even sure what time Noah is supposed to leave as the actual time of his leaving varies so dramatically. Sometimes he walks to the school bus stop, which is about a mile away. More often he takes a public bus to the school bus stop or when he’s really running late or trying to finish some undone homework, Beth drives him to school. I guess they leave around seven a.m. on average, but sometimes it’s as early as 6:45 or as late as 7:30. 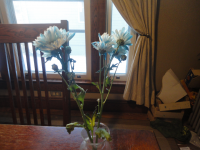 The difference on Friday was that after driving Noah to school, Beth headed out to the grocery store to buy a bouquet of blue flowers for June to take to school for Valentines Day. She wanted one flower for her morning teacher, one for her afternoon teacher, one for her morning bus driver and one for her afternoon bus driver. I’m not sure why she specified blue, but Beth said there were a lot of artificially colored flowers there and she thought she could find blue ones. I was expecting dyed flowers, but the flowers she bought were actually white with some blue tinting spray-painted onto them. June left for school with her freakish flowers and with lollipops for all her classmates. This might have been the first year she didn’t make any homemade valentines. I know last year it was mostly store-bought. And that’s basically what she brought home, candy and store-bought valentines, with a couple simple red construction paper hearts, nothing like the elaborate creations she used to make and receive in preschool, kindergarten, and first grade. It made me a little sad, but I guess that’s part of growing up. In two or three years, she’ll be too old for valentines at all (except maybe for family)…until she isn’t again. Saturday morning Noah was not ready to exchange Valentines yet, as he was still working on our cards, so we left for June’s basketball game, agreeing to do it when we came home. The Pandas lost their fifth straight game, actually getting shut out for the first time this season. The score was 8-0. It’s hard to explain that they are not playing as badly as it might sound like they are. Put as simply as possible, they prevent a lot (but not all) of the opposing teams’ balls from going into the basket, and they take a lot of shots at the basket, but for the most part they just don’t go in. Sometimes the shots are wild, but maddeningly often they bounce off the rim. June’s actually having a pretty good season. She’s gotten a lot more aggressive on the court. She steals the ball and takes shots at the basket much more often than she did in previous seasons, though she’s never gotten a basket in a game. (She gets them in practice all the time.) In this game she took a ball to the face, which caused her to bite her tongue so hard it bled. She sat out the rest of the quarter but when she came back into the game, she played just as hard as she had previously. That’s heart. Back home, candy was exchanged, as well as cards. June also received sidewalk chalk and glitter glue, which she put to almost immediate use. “I was almost out of glitter glue,” she said appreciatively. Noah got a t-shirt with Roscoe the rooster, the unofficial mascot of Takoma. I got a Starbucks gift card and my favorite hazelnut-Ceylon tea (special ordered from the tea shop in Rehoboth) and Beth got a gift certificate for two movie tickets. Everyone was happy. That evening Beth and I headed out to the movies. It was snowing when we left and icy roads were predicted but we decided to go anyway. We saw Birdman, which I really liked, especially the uncertainty about what’s real and what’s not and the way it used point of view. When we emerged from the theater, the roads were indeed a mess. We could see cars spinning their wheels and Beth said she thought maybe we should leave the car in the parking garage and take a bus home. But after we waited fifteen minutes at a bus stop that usually has a stream of buses arriving and only one came in all that time (and not the route we needed), she decided to chance the drive home. There was a bus stuck just a block from the bus stop and getting stranded if a bus had to offload halfway home didn’t seem appealing either. Beth had to think a lot about the best route home, assessing each intersection and what looked safest and changing course several times. We ended up on Sligo Creek Parkway, where traffic was slow, but moving. There wasn’t a lot of snow on the ground but the winds were so high it was blowing all over and all the tree trunks and signs were coated with snow. Close to Maple Avenue, we saw a car in the creek. I should clarify here that in this part of the country we don’t call any body of water that would be deep enough to sink a car a creek. Those are rivers. The creek in question was probably about a foot deep and the car nearly spanned it. The headlights were on and there was a woman, or maybe a teenager standing on the bank. I called 911 to report it and the dispatcher thanked me but said someone else had already called about it. When we got to the hospital near our house, the roads were very well cleared and we got up the hill of the hospital campus with no trouble. Beth decided to park the car there as our street might be messier and we were close enough to walk home. We picked our way through the icy parking lots and sidewalks as the snow swirled around us, passing a few people trying to push a car along our street. I wished I’d worn a warmer jacket. Beth wished she wasn’t wearing crocs. We got home an hour after we set out on a trip that usually takes ten or fifteen minutes, but as we lay in bed listening the wind whipping around the house and rattling the windows and the sound of snowplows scraping the roads, I felt lucky to be warm and safe and that Beth got us home. That’s gratitude. Monday was President’s Day so it was supposed to be a long weekend and then Tuesday was a snow day so the weekend just went on and on… Knowing this was likely to happen, I worked a little every day from Sunday to Tuesday, trying to stay more or less on schedule. Sunday morning Noah and June watched a movie, Cloudy with a Chance of Meatballs, together. They hardly ever do this anymore and I was touched by the sibling togetherness, even if they did have an argument about how long to pause the movie for a breakfast break. (Later I found out they’d also been working on a movie they started filming last fall while we’d been out the night before.) They went out briefly to play in the snow that same morning, but it ended badly with June crying because Noah had dumped snow on her face and then he was grumpy because she left him alone after begging him to come out and play with her. But he made it up to her by coming in and making her cocoa. We ate a lot of comfort food over the course of the weekend. 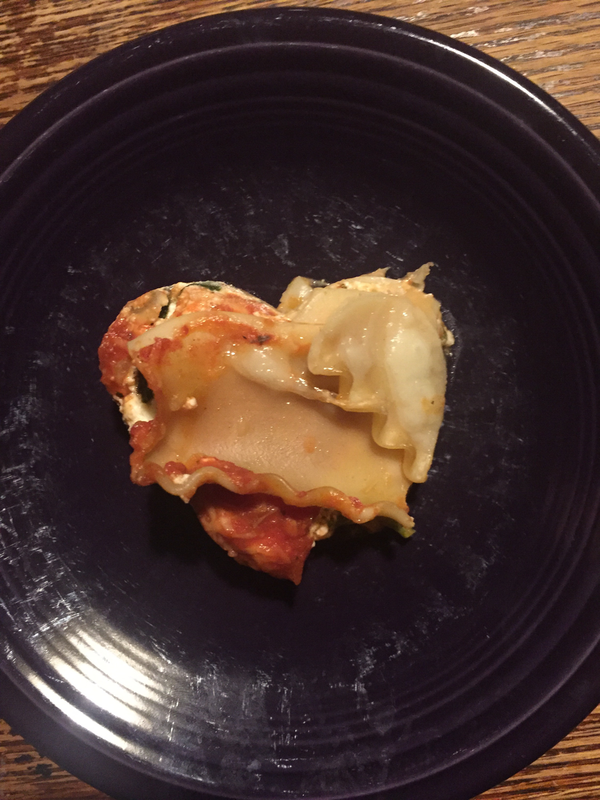 Beth made spinach lasagna and garlic bread Sunday night and pancakes and fruit salad Monday morning. I made braised cabbage and carrots, with mashed potatoes and fake Italian sausage on Monday night and fake beef and cremini stew on Tuesday night. Tuesday I was a little grouchy about the snow day. I just wanted the kids to go to school and leave me in my quiet house and the morning was challenging. I was trying to work and the kids were bickering and June kept interrupting me to tell me she was still bored. But she had a friend over for most of the afternoon and things got better. They played outside and built a platform out of blocks where Playmobil people enacted some kind of drama and they wrote more stories. June was working on a sequel to “Another Orphan Made” and Maggie started a series called Horror Hilarious, which I am assuming is some kind of horror-comedy hybrid. We walked Maggie most of the way home (her mom met us on the way) and it did me good to get out into the bright, sparkly day. It is always pretty down by the creek when it has snowed. Earlier in the day I had cheered myself by buying spring clothes for June and looking beach houses to rent for our summer vacation in late June. I found one I really liked, close to the beach, beautiful, and a workable arrangement of bedrooms for all the relatives we’re inviting. It was pricy, though. When we got home, I saw Beth had answered my email about the various houses with the following message, “Let’s rent the one you love.” That’s love for sure. Looking at my recent posts you might think my life is one never-ending celebration. (They go straight from Beth’s birthday to Thanksgiving to Christmas to our anniversary.) Believe it or not, this is not the case. So I thought before Valentine’s Day rolls around, I ought to write about a regular day. It should be a weekday, I decided, and one June had an afterschool activity because there are three of those every week, which is more than the two weekend days or the two weekdays she doesn’t have an activity. The problem was, the week I got this idea there weren’t many normal days. Sunday afternoon Noah started to feel unwell. He was tired and headachy and had a sore throat so bad he was having trouble swallowing water. Given that I’d been diagnosed with strep throat six days before, Beth and I were sure that’s what he had, but when she took him to the urgent care on Monday morning the rapid strep test came back negative, as did the cultures at twenty-four and forty-eight hours. Anyway, he was in no shape to go to school Monday, so he stayed home. He slept most of the morning and then tried to do some homework in the afternoon. After school, June had her violin lesson. It was her first lesson since we got a new time slot (4:45) that gets us home in time to cook and eat dinner at a less frenetic pace than has been our wont on Mondays for the past few months. I can’t tell you how happy I am about this. Now that June has activities either shortly before or after dinner three nights a week, cooking has become a real stressor for me. Tuesday was a snow day. It was not a particularly impressive snowfall (less than two inches) and the roads seemed pretty clear, but nonetheless, the kids were home. As snow days go, it was okay. I’d worked over the weekend to bank enough hours to take it easy for this very contingency, so I didn’t need to work much. 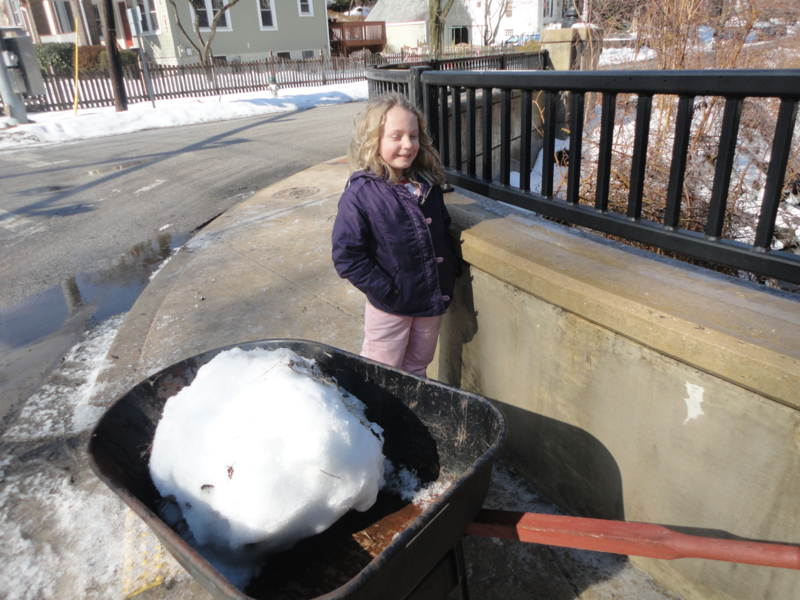 June played outside at my strong suggestion, sledding down the little hill in our yard and throwing snowballs at the fence. She and I read These Happy Golden Years and made homemade whoopie pies, which were very well received by everyone but especially Beth who is a big fan of this confection. Even though school was cancelled, June’s Girl Scout troop meeting was not, though it took an email thread of at least a half of dozen messages from several moms (whose opinions were all over the map) before the troop leader finally settled the matter. Wednesday Noah went back to school, still a bit sick, but better than he’d been. I was looking forward to getting back into the swing of a normal weekday, but it was not to be. Registration for Girl Scout sleep-away camp opened at ten a.m. I knew from other moms that this is the kind of camp that can fill up within hours, so I logged on right at ten, with June’s list of top five programs. She and three other girls from her troop had spent a couple days trying to match their lists in order to get into the same program at camp. In the end everyone compromised some but they could only get their top two to match. Their first choice was Backwoods (which takes place in a wooded area of the camp) and their second choice was Watered Down (which features swimming, canoeing and kayaking). The first thing that happened was that I was given a place in the queue. There were more than twelve hundred people in front of me. Yes, you read that right. Twelve hundred. It took about an hour to move through the queue and then early in the registration process my page inexplicably froze and would not progress to the next page. It wasn’t the computer freezing, my cursor moved fine. I called the help line and I was so relieved when they said they’d call back and register me over the phone that I waited too long for that to happen (about another hour) before I gave up on them and started again on the laptop. In the meantime I’d gotten a message from the mom of the one of June’s friends saying two of the girls had gotten into Backwoods, but it was closed now, and her daughter was in Watered Down and I should really register June now as spaces were filling fast. This time I got far enough into the process to find out that June was not in the database as being a Girl Scout even though I had filled out the paperwork and paid dues for both her troop and the national organization in the fall when she joined. I found out later the troop leader never processed that paperwork. Anyway, it was a fairly simple matter and only $15 to join the Scouts online and I did it, rather than lose more time. On my next attempt to register her, my session timed out right at the end and I had to start over. This whole time I could see the number of spaces in each program and watch them getting lower (and in some cases selling out). I kept telling myself quite sternly that this was not a matter of life or death and I did not need to feel so stressed, but didn’t listen to myself and I was near tears more than once. However, the fourth time was the charm and shortly before one in the afternoon, I got June registered in the water program. I thought it was a pretty good outcome, with two girls in each program, so everyone will have a friend, and the four of them have requested to bunk together. The help line never did call me and a big chunk of my workday got sucked into a black hole, but I was so giddy with this accomplishment, I didn’t care. 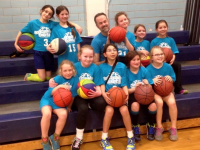 Thursday I woke up in a good mood, partly because of my Girl Scout camp triumph, and partly because June had basketball practice that evening. I do enjoy watching the Pandas practice, but more importantly, most weeks this is my prime opportunity for conversation with an adult who isn’t Beth, aside from the five minutes I spend at June’s school bus stop every weekday morning. June had an 8:00 a.m. GeoBowl practice session before school, so we left the house early, at 7:45. I meant to leave five minutes earlier, but the last time she had one of these I didn’t even remember it until 7:45 and considering that at the moment of realization I was in pajamas and hadn’t eaten breakfast and it’s a twenty-minute walk to her school, the fact that I got her there by 8:15 is really not too shabby. Anyway, I was happy to have improved on our previous performance. It was a cold morning, and when we got to the creek, June peered at the ice-rimmed rocks in the middle of it and noted how the dead leaves on the ground next to it were outlined in frost. I warned her not to step on a half-frozen puddle and she probed it with her sneaker toe gently until the ice on top broke. There was the thinnest skin of ice on the creek, too, in the still parts. I didn’t hurry her along because she seemed so genuinely interested in her surroundings. We were about a block and half from home when I noticed she wasn’t wearing her backpack, which contained her GeoBowl packet, her homework and her lunch. So much for getting there earlier this time. I found I really didn’t mind. My good mood was that durable. We went back home and set out again. Just before the playground, we came across a snowman someone had built. It had stones for its eyes and nose, a twig for a smile, a garland made of evergreen and a scarf of dried pokeweed stems. It was listing a bit to one side but that only added to its rakish charm. We got to school by 8:10 and I left her with her geography-studying peers and came home, after a detour to Starbucks. Once home, I tidied the study, exercised, ghost wrote a blog post about cherries and wrote some marketing materials for a cherry blossom extract. Once June got home, she did her homework and had an early bath. I made dinner and tried to talk Noah through an analysis of “The Long and Winding Road,” which he had to analyze for English class. He was having a hard time with it, despite the fact that the song is not that complicated. I think he might have still been fatigued from his illness. We got a ride to practice with June’s friend Megan, her sister, and her mom Kerry. As we waited for them, we sucked on two of the last few candy canes we have left from Christmas. The taste was sweet and sharp on the cold, dark porch, lit with the blue and white lights we still have strung along it. When their car pulled up, we gave Megan another candy cane, and she was excited to have it, even if she had to share with her sister. At basketball practice I was happy to see Talia’s mom, also named Megan, whom I hadn’t seen in a couple weeks. She’s recently returned from a vacation in Puerto Rico so there was that to talk about and she wanted to know more about the Girl Scout camp registration process because the camp her daughter wanted to attend was starting its registration the next day. 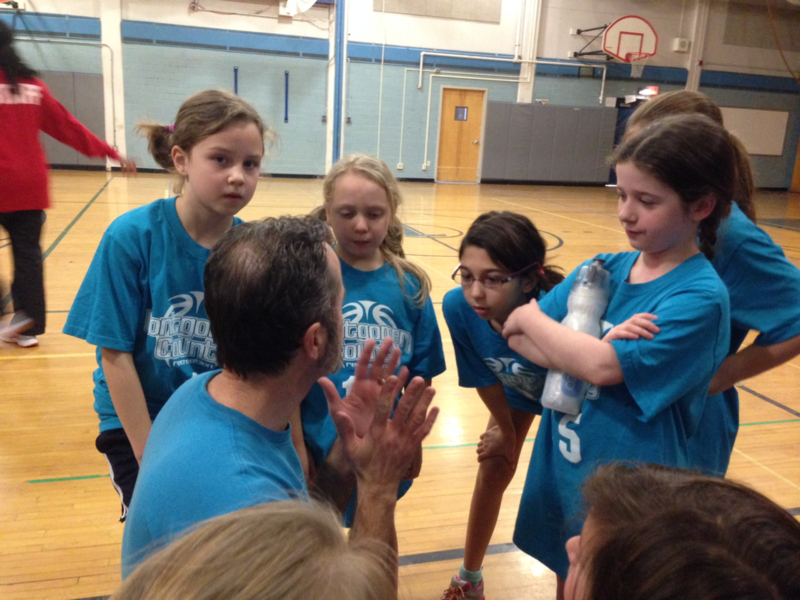 At the beginning of practice Mike gave the girls a pep talk about how they shouldn’t be discouraged about their losing streak. (They have lost all three games this season.) He told them he knew they were disappointed and he was too but that since the score was 10-4 at the last game and eight of the other team’s points were scored over the course of several minutes, the Pandas had lost four minutes of the game but they’d won the other twenty-eight. Pretty good spin, I thought. I had my eyes on the girls most of the time I was talking to Megan, but somehow I missed June scoring two baskets during a drill. She is definitely getting better. 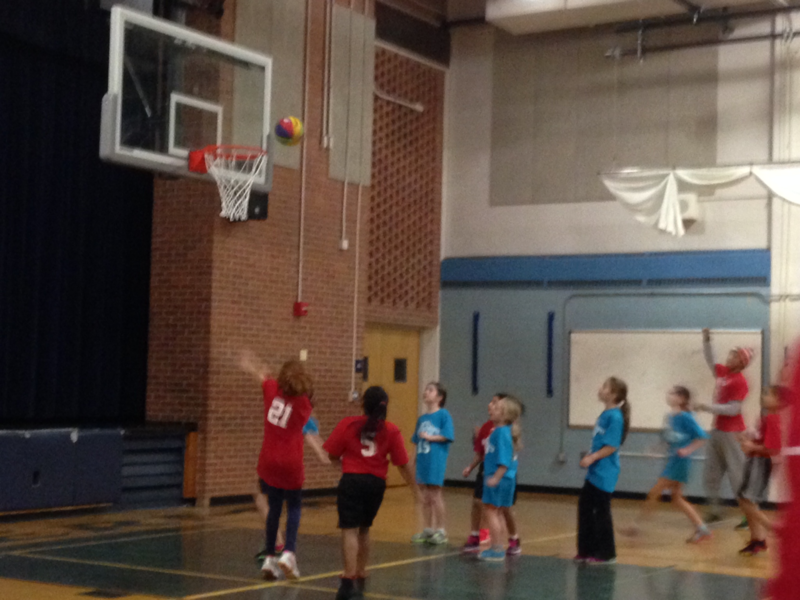 In the second game she very nearly scored a basket. 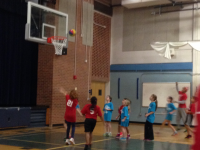 It bounced off the rim and then she caught the rebound and shot again. That one went wide, but still, that’s good playing. She also had a few good steals from opposing players. As a result, she’s not too discouraged about how the season is going. We came home, put June to bed, and I nudged Noah along until he finished his song analysis. It had been a week of many ups and downs (dare I say a long and winding road?) but I was happy to have arrived at a day just like this day. Last week on Thursday evening toward the end of basketball practice, June’s coach divided the team into halves and they played a brief scrimmage. “Find your girl!” he yelled, encouraging them to stay near the opposing players they were supposed to be guarding. I was sitting on a bench with Kerry, Megan’s mom, chatting with her and enjoying the chance to watch the Pandas practice and to relax a little near the end of a busy week. We’d had three inches of snow early Tuesday morning, which led to a snow day that day and two-hour delay on Wednesday. It had been my first normal workday in a few days and I was feeling a little harried, but I was looking forward to Saturday because the Pandas would be playing their first game of the season, and we had other plans as well. Saturday morning we arrived at the parking lot of the school where the game would be played around 9:40. Mike, the coach, and Maggie, his daughter, fellow Panda (and one of June’s oldest friends) were getting out of their car. “Hooray! It’s June!” Maggie cried. Clearly she was excited about the game, too. After incarnations as the Purple Pandas (kindergarten), the Red Pandas (first grade), and the Golden Pandas (second grade), June’s basketball team is the Blue Pandas this year. Most of the girls are returning players, though there are two newcomers. 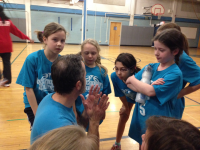 We lost our star player from the previous three seasons because she’s playing on a fourth grade team this year with her sister to streamline her family’s hectic schedule. 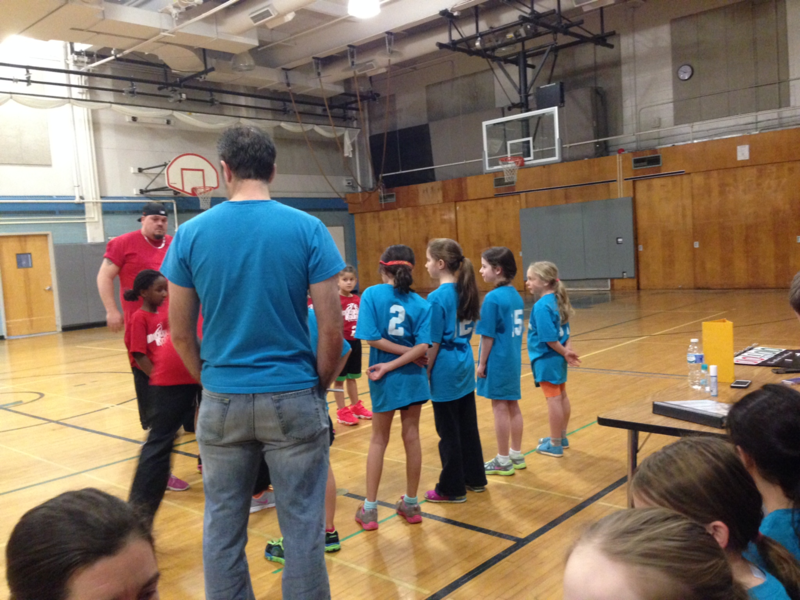 (They have four girls and I think they’re all in organized sports.) It’s possible this girl may have scored half the baskets in all of Panda history, and I suspect this might be a rebuilding season. It will be different in other ways, too. They’re playing in a middle school gym this year instead of an elementary school gym, which means instead of sitting on the floor or standing, parents watch from the relative luxury of bleachers. Now that they’re in third grade there’s official scorekeeping for the first time and some rules are more strictly enforced (Mike worked hard reviewing the concept of travelling at practice). One new rule we didn’t know about ahead of time was that the girls can’t wear any jewelry on the court. June’s been wearing a necklace with a tiny dolphin on it for months, maybe as long as a year. She never takes it off. The clasp at the back was completely wound up in hair that had gotten tangled around it and wasn’t even visible. It was starting to remind me of Victorian hair jewelry, but right now it was presenting us with an unexpected problem. Could we get it off before the game started? Beth tried to saw the hair with her keys but it didn’t work. We asked around to see if anyone had a penknife, but the closest we could get was a set of nail clippers. Thanks, Kerry! Finally, Beth got the hair off the clasp and removed the necklace. Meanwhile, two girls with newly pierced ears fretted about whether or not to take out their earrings, which were not supposed to be removed. One girl took hers out and covered the holes with Band Aids to ward off infection and the other girl secured one-time permission to leave hers in her ears. Once that excitement was over, there was a short practice period. I saw June make a basket, but I missed seeing her get hit on the nose with a ball. I only saw her crying and Mike putting his arm around her shoulder and comforting her. She recovered quickly enough to play in the first quarter. 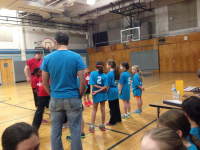 When it was time to play the teams were lined up and each girl was assigned a player to guard. I was glad to see there was a girl almost as small as June on the other team (the Red Warriors) and that she and June were paired with each other. The Warriors scored almost immediately and Beth predicted, “They’re going to lose.” I thought it was a little soon to say and sure enough the Pandas scored two or three times before the Warriors scored again. At the end of the first quarter the score was 6-6. June’s counterpart was fast and a good passer and Mike had to remind June, “Find your girl” a few times until June started sticking closer to her. June sat out the second quarter and played again in the third. She said later she liked this arrangement, getting to play and then rest and then play and then rest. The Pandas didn’t score after the first quarter and lost the game 12-6, but it felt closer than that. There were a lot of baskets that teetered on the rim and ended up falling the wrong way. I didn’t see quite as well thought out and strategic passing as the Pandas had last year, and as Mike pointed out at the next practice they weren’t hustling for the rebounds, but it’s early in the season. They play until early March this year, so there will be plenty of time for them to gel as a team. I am looking forward to watching that. After the game June was hungry and wanted an early lunch at California Tortilla. It’s in the same shopping center with a Starbucks and a Trader Joe’s and we needed to pick up some mac and cheese anyway, so we headed over there and got quesadillas and coffee— I tried the new Flat White, which is kind of between a cappuccino and a latte in terms of foam—and more than $50 worth of groceries because that’s what happens when you go into Trader Joe’s for mac and cheese, or it’s what happens to us anyway. Back at home, I helped Noah study for his science and English midterms for a couple hours and then Beth and June and I went to the community center to hear a storytelling presentation. One of the storytellers was Noa Baum, whose CD (Far Away and Close to Home) Noah loved when he was younger and June loves now. In fact, when we invited Noah to come, too, he wavered and almost decided to come, too, before opting to stay home and practice his bells and drums. I think he would have enjoyed it because in addition to an Anansi story I hadn’t heard before (Noah used to be a big Anansi fan), she also told both kids’ favorite story from the CD, about a clever turkey who defeats the rich man who steals a gold piece from him. June, who had been listening intently all along, lit up when she started in on that one. We came home and had a quick dinner. I reheated leftovers for Beth and myself while Noah made the mac and cheese for June and himself because Beth and I were going to a movie, which we don’t do nearly enough, especially considering we don’t even need a to get a sitter anymore. 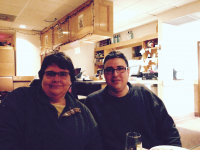 But it was the day before our wedding anniversary, so that spurred us to go on a date. We went to see The Imitation Game on my mother’s recommendation. Toward the beginning of the film, during the first boarding school flashback, Beth’s phone vibrated and she went out into the lobby to answer it. I could hear her saying, “What’s up, Noah?” as she went through the doors. She was gone a good ten minutes, which was confusing, because I thought if it was an emergency she would have run back in for her coat and we would have been out of there, but if it wasn’t an emergency I thought she’d tell him it could wait. “A minor emergency,” she whispered back. June had a splinter in her foot and Beth had been trying to calm her down and then talking Noah through the removal process. It was the first time he’s ever taken a splinter out of someone else and he did a good job staying calm, but then again calm is his default setting (not unlike Alan Turing, though it seems unlikely Noah will break a code and help win a war). I tried to remember the parts Beth had missed and to fill her in as they became relevant later in the film, which was very well acted and moving, I thought. Even with the small crisis at home, it was a fun evening. The next day was our actual anniversary. We exchanged practical gifts. I got Beth a new case for her phone, because she needed one and she got me swim goggles and an umbrella, because I needed those. In the afternoon I made a cake, the same cake we had at both our commitment ceremony twenty-three years ago and our wedding two years ago. In her card I wrote, “Thank you for making my middle age much less terrible,” because we’d recently discussed this article from the Post. It was another hectic week. Two more two-hour delays (one for ice, upcounty I guess—I didn’t see any here, and another one for a dusting of snow) cut into my workdays. 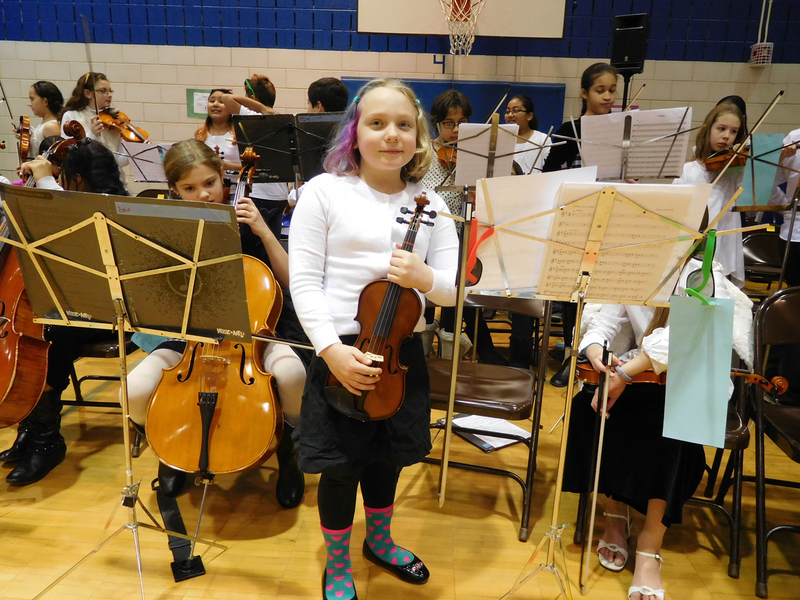 I was so hurried getting dinner ready before June’s violin lesson on Monday afternoon that I didn’t answer the phone call that would have told me it was cancelled and we waited at the bus stop in a cold rain to go to the music school and only to turn around and go straight back home. Wednesday I had a book club meeting and I couldn’t get the book read in time, which was frustrating. Still even with these irritants, I know my week, my middle age, and my life is a lot less terrible than it would have been if I hadn’t found my girl.